More than 44,000 home-based caregivers no longer are part of the SEIU Healthcare Michigan, according to federal reports filed by the union. The workers previously were forced to pay dues or fees to the SEIU after the union orchestrated a scheme that took money from the Medicaid checks of the people the workers were caring for in homes across the state. The "dues skim" ended in 2013, but not before the SEIU took more than $34 million from the elderly and disabled across the state. According to the union's LM-2 report filed with the U.S. Department of Labor, 44,347 home-based caregivers have opted to stay out of the union. That number represents virtually all of the long-term home-based caregivers affected by the dues skim. It also is more than 80 percent of the 55,265 members the union claimed to have at the end on 2012. Most of those who have remained in the union are workers employed at private medical facilities and joined the union in traditional organizing drives. The SEIU health care workers were organized in a mail-in effort that most did not participate in nor did they know a vote was even taking place. In the mid-2000s, the Service Employees International Union targeted the assistance checks of Michigan participants in the federal Home Help Program as a potential revenue source. The Home Help Program, which began in the 1980s, allows the elderly and disabled to be cared for in their homes instead of being put in nursing homes or long-term care facilities. A majority of the caregivers in the program are family members or friends who take care of loved ones. The dues skim scheme was created in 2005 when Jennifer Granholm was governor and incorporated the use of a dummy employer, the by-mail election, and assistance by some Republicans in the Legislature who did not act to end the scheme with legislation. The dues skim lasted from 2006 to early 2013. 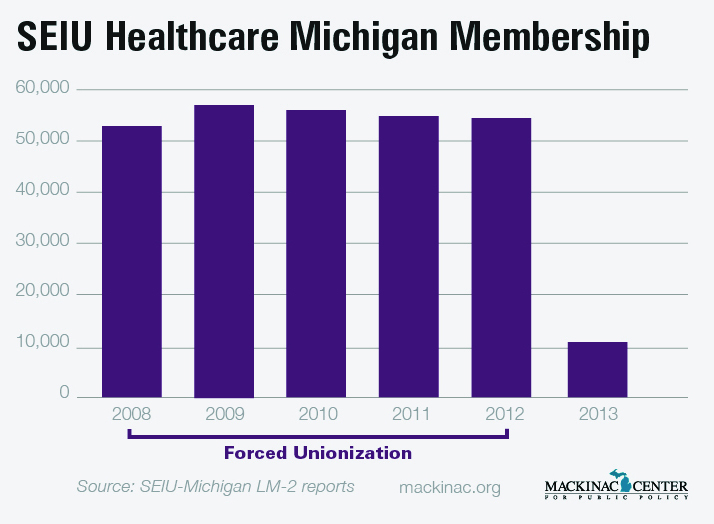 During those years, the SEIU Healthcare Michigan boasted that it was the fastest growing union in the state. However, according to the union's LM-2 report, its membership has fallen to 10,918 since the home-based caregivers were freed from the forced unionization on March 1, 2013. "This evidence shows the truth about the Granholm-inspired unionization of those in the Home Help Program," said Patrick Wright, director of the Mackinac Center Legal Foundation. "When given the choice, those in the program didn't want to give the union a dime." A majority of the 10,918 members the union claimed to have in 2013 work at private medical facilities. But it is likely that figure includes a formulated number of home-based caregivers to represent the fact that the forced unionization remained in force during January and February of 2013. If so, next year's report likely would disclose an even smaller membership in the union for 2014. SEIU Healthcare Michigan’s disclosure reports of previous years appear to have used some sort of formulated method of determining how many home caregivers were union members. These union estimates have consistently been in the neighborhood of 45,000. However, the Michigan Department of Community Health (MDCH) has counted more than 60,000, based on how many individual home caregivers had dues and fees taken out of their checks. The discrepancy seems to be a result of the fact that even caregivers who were only briefly in the program were automatically unionized and subject to the deductions. Precisely how the union has accounted for those temporary members in its reports to the government is unclear. SEIU Healthcare Michigan officials did not respond to a request for comment. The amount of dues and fees reported as having been received by the union reflected the end of the home health care dues skim as well. According to the disclosure report, in 2013 the union received $7,119,322 from dues and fees. That is $4,187,992 less than the $12,078,838 the union reported having received from dues and fees in 2012. Roughly $1 million of the $7,119,322 was apparently from home-based caregivers who still had union dues and fees deducted from their Medicaid checks in January and February of 2013. The rest came from members employed in private medical facilities. The loss of 80 percent of its members has not been the only blow to the SEIU Healthcare Michigan over the past year and a half. Seven of the eight protesters arrested at the state capitol building in December 2012 were identified as employees of the union. The arrests took place during demonstrations against the passage of Michigan's right-to-work law after the protesters tried to force their way onto the Senate floor. In addition, the SEIU, the international union behind the SEIU Healthcare Michigan, was fined almost $200,000 for concealing that it bankrolled Proposal 4 of 2012 — the failed ballot effort to lock the forced unionization of home-based caregivers into the state constitution. According to state officials, the penalty the SEIU was assessed for the campaign finance violations was the second largest in Michigan history. The Mackinac Center Legal Foundation has filed a legal action with the Michigan Employment Relations Commission in an attempt to get back some of the dues that was taken from home-based caregivers. That case is still pending.